Well, it appears that the US jobs market didn’t get the memo that a recession is just around the corner. Payrolls rose a very strong 312,000 in December, bringing the full count of jobs added for 2018 up to 2.6 million, the strongest year for job gains since 2015. Unemployment ticked up to 3.9 percent, but largely because more people were drawn into the labor market, as the participation rate ticked up two-tenths to 63.1 percent, its highest level since early 2014, and yet another reminder that the job market has more capacity to expand than many observers heretofore believed. 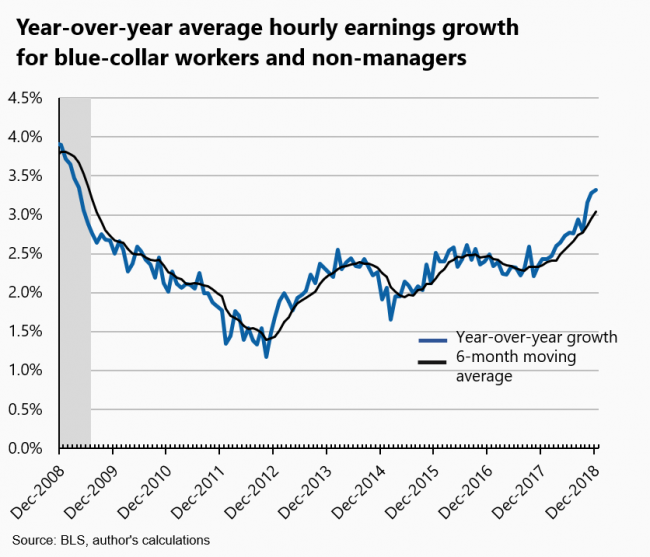 Nominal wage growth accelerated slightly and, at 3.2 percent for all private sector workers and 3.3 percent for mid-level earners, both measures tied cyclical highs. Weekly hours edged up slightly, jobs gains for the prior two months were revised up, and a very high 70 percent of private industries added jobs on net. In other words, not only is the US labor market holding its own, it’s actually gained momentum in recent months. Moreover–and remarkably–these uniquely strong results are occurring against a backdrop of low, stable inflation, implying that the Federal Reserve could still conceivably pause in their rate-hiking campaign, accommodating job market improvements that are so essential to middle and low-wage workers. 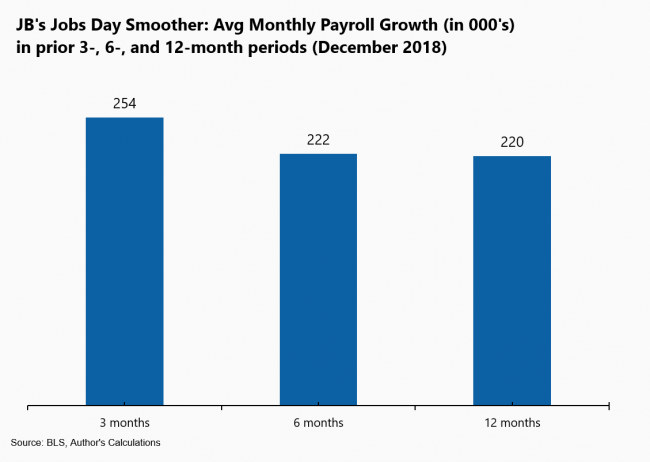 To boost the underlying signal from the jobs data, our monthly smoother takes 3, 6, and 12-month averages of the monthly job gains from the payroll data. First, note that the bars show relatively high levels of job creation at this stage in the expansion, as many economists believed monthly gains would be slowing by now as the job market neared peak capacity. But at 254,000, the average monthly gain over the past quarter has been slightly higher than the earlier trends. Tighter labor markets continue to noticeably boost wage growth, as shown in the two figures below. Nominal hourly wages were up 3.2 percent, year-over-year, for all private-sector workers, and 3.3 percent for middle-wage workers. 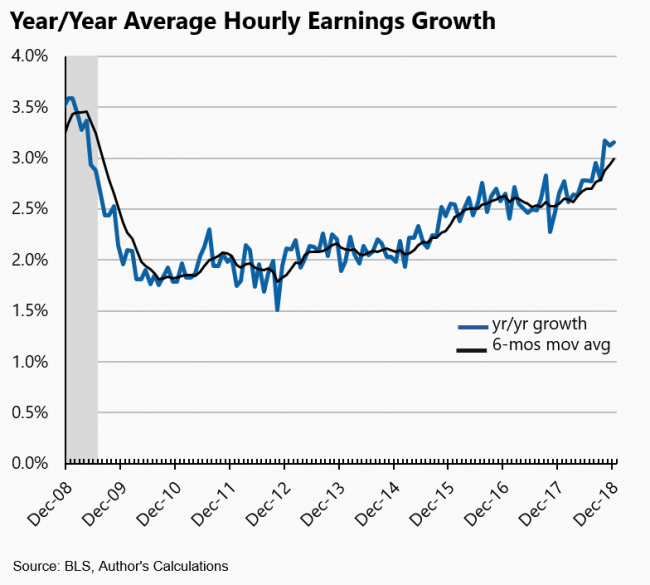 The smoothed, 6-months moving average shows evidence of “wage-Phillips curve” awakening in 2018: low unemployment finally started to correlate with rising pay pressures. As discussed next, thanks largely to low energy prices, I expect real wage growth of over 1 percent for middle wage workers in 2018. While not a particularly high real growth rate in historical terms, it represents an important gain for working families. With today’s report, we can evaluate the 2018 job market in historical context, as in the two tables below. The first focuses on jobs and the second on wages. Annual changes are for December 2017 over December 2018; level variables are for December 2018 (all these values may undergo some revisions). Payrolls grew by 1.8 percent last year, a comparable, if slightly higher, rate to earlier years in the cycle, with gains of about 220,000 per month. The unemployment rate remains below that of earlier years in the last decade, and 6 percentage points below the almost 10 percent rate at the end of 2009, near the trough of the Great Recession. Another measure of labor slack—the employment rate of prime-age workers—at 79.7 last month, is still climbing back to its pre-recession peak of 80.3 percent reached in January at that year. The next table offers a longer historical perspective on the growth in the hourly pay of middle-wage workers at business cycle peak years and 2018 (which may or may not turn out to be a peak year). 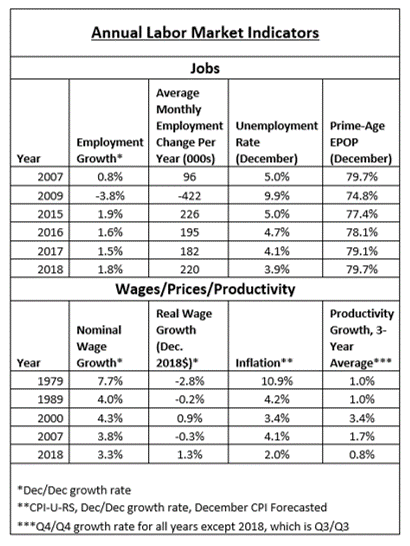 Some key determinants of mid-level wage growth include the pace of inflation, productivity, unemployment, and bargaining power (which is, in turn, related to low unemployment, as well as unions and the depth of government labor standards, like minimum wages). Thanks to the pressure of tighter labor markets, nominal wage growth picked up over the year, as shown in the figures above. But it remains below that of prior peaks. Part of this relates to lower inflation, and, in fact, real wage growth was faster for mid-level workers last year than in 2016-17, at least based on my forecast for December inflation (which isn’t out yet; my guess is that CPI inflation is up 2 percent, Dec/Dec). The key lesson is that very tight labor markets generate real gains for working people, even with productivity quite low. Importantly, these gains are occurring in the current economy without generating inflationary pressures, both in actual and in expected inflation. Any economic model that insists the monetary authorities hit the brakes hard to preclude further such gains is clearly out of touch with reality. Amidst this positive labor market news, various economic headwinds have kicked up of late. Highly volatile financial markets, Trump’s trade war, slower growth abroad, and fading fiscal stimulus are leading to some grim forecasts for near-term U.S. growth. Conversely, low unemployment, job gains, and higher real wages can be counted on to boost consumer spending, which is almost 70 percent of the U.S. economy. In other words, the economy faces both headwinds and tailwinds, with the latter reflecting the job-market induced strength of the highly acquisitive American consumer. 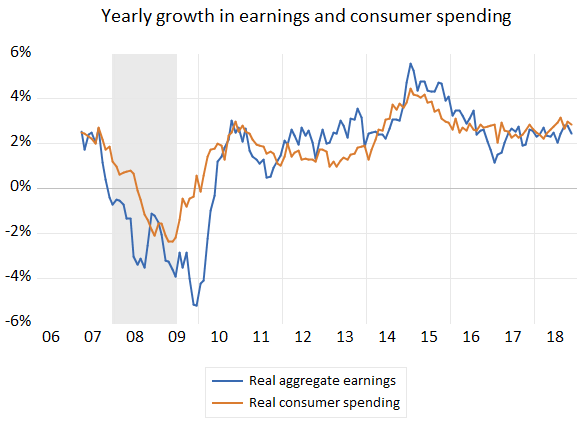 The next figure shows this relationship by plotting yearly growth rates of real, aggregate, weekly earnings (jobs times real wages times hours per week) against real, economy-wide consumer spending (not including December’s results). They track each other well, though less so in recessions, when households dip into savings—if they can—to smooth their consumption through down labor markets. Most recently, both series have been steadily tracking 2.5 to 3 percent and my expectation is that this trend will persist, if not strengthen in coming months, as stronger real wage gains support spending. However, the headwinds noted above are real and, especially as fiscal stimulus fades later this year, growth will likely slow, as will job gains, threatening the dynamic portrayed in the previous figure. For now–say, over the next 6-12 months–strong consumer spending should provide the US economy with good momentum. But it is important to sustain these gains for as long as possible, as it took a long while for many working households took benefit from the expansion. Share the post "Payrolls up big as a strong jobs report caps a strong year for the US labor market"